The Proslat hook kit includes 20 of our most popular hooks. Made from high grade steel, these hot dipped rubber coated hooks with solid 1/8-inch back plates work to disperse the workload throughout the wall. You can hang whatever you want! These hooks can handle any garage organization. Hooks are designed to work with Proslat PVC slat wall organization. Silver powder-coated finish for increased resistance. Includes: twelve 4-inch hooks, two 8-inch double hooks, two 4-inch double hooks, two Heavy Duty Hooks, and two "U" hooks. Proslat Hooks & Accessories are designed & engineered exclusively for Proslat wall panels. Hooks & accessories are made of high grade steel and powder coated in Proslat silver. Eradicate the mess from your garage and save yourself time and money wasted searching for stuff in the garage with the Husky Track Wall Storage System. The Starter Hook Kit is the perfect companion to your Husky Track Wall Storage System, and offers a selection of the most commonly used storage hooks, including: 11 - 4 inch Single Hooks, 2 - 6 in. 'J' Hooks and 2 - 8 in. Double Hooks. This 15 piece Started Hook kit makes it simple to take the guesswork out of garage organization and offers hooks for shovels, rakes, tools and loads of smaller gear that takes up valuable floor space in your garage or shed. Add more Husky Track Wall accessories to customize your storage. Start your garage makeover project today! The Proslat Basic Bundle includes 32 square feet of versatile slat wall storage and organization and 20 multi-purpose hooks. This bundles consists of: 10 Proslat panels, covering an 8-foot x 4-foot section or 32 total square feet, twelve 4-inch single hooks, two 4-inch double hooks, two 4-inch double hooks, two heavy duty U Hooks, and two super Duty U Hook/Bike hooks. Panels feature our patented hidden screw design which means no visible hardware for a truly clean and modern look. Hooks are made from high-grade steel, have back plates designed to disperse the load throughout the wall, are silver powder-coated finish for increased resistance. Wall panels have lifetime warranty, hooks and bins have 10 year warranty. Wall Storage Solutions Hook Kit (20-Piece) The Proslat hook kit includes 20 of our most popular hooks. Made from high grade steel, these hot dipped rubber coated hooks with solid 1/8-inch back plates work to disperse the workload throughout the wall. You can hang whatever you want! These hooks can handle any garage organization. Hooks are designed to work with Proslat PVC slat wall organization. Silver powder-coated finish for increased resistance. Includes: twelve 4-inch hooks, two 8-inch double hooks, two 4-inch double hooks, two Heavy Duty Hooks, and two "U" hooks. 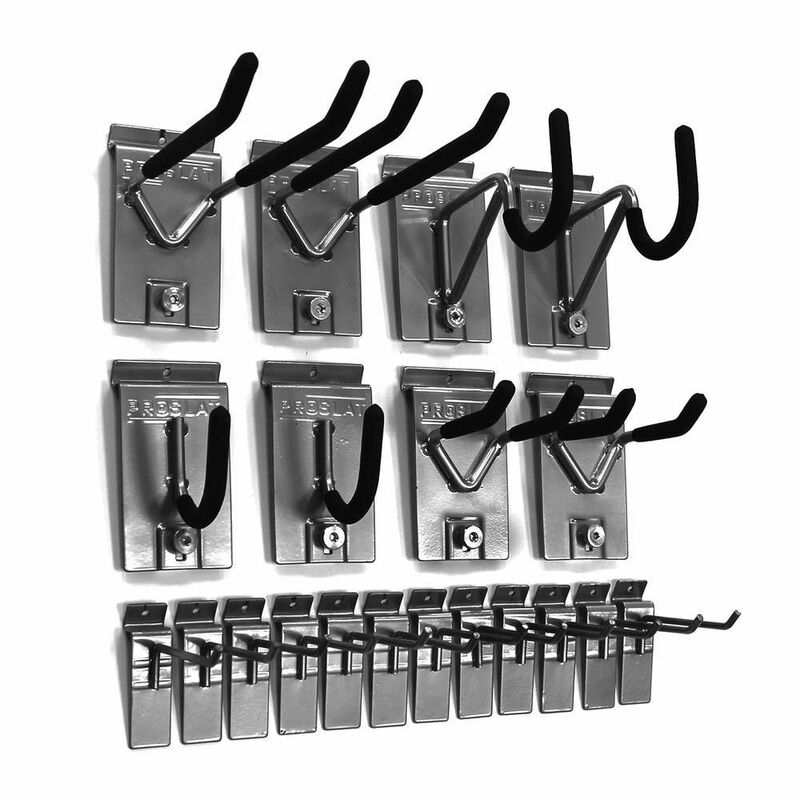 Wall Storage Solutions Hook Kit (20-Piece) is rated 4.5 out of 5 by 55. Rated 3 out of 5 by Drew from I would not buy any proslat until all of the materials and accessories are carried in Home Depot ... I would not buy any proslat until all of the materials and accessories are carried in Home Depot stores. If you need another hook or latch to place on the board, or another J or L trim (you will need extras if you do anything other than the recommended size of the wall panel you bought eg - I did a bunch of 4'x1' proslat walls) you will have to order it to your home or store and it takes a week to get it. I am in over $500 so I have to keep going. If I were to do it again, I would go for any other product that is carried in stores so it would not be such a long process to get this stuff installed and working to satisfaction. Also, this is a 2 man job for installation. Rated 5 out of 5 by Thunder from Fantastic! Met all of my expectations. Fantastic! Met all of my expectations. Rated 5 out of 5 by Robert from Works great, actually getting my garage organized! Works great, actually getting my garage organized! Rated 5 out of 5 by PJ from Great to hang all my tools on the new slat... Great to hang all my tools on the new slat board we hung. Now my garage is well organized! Are these hooks compatible with an MDF slat board? Hi Brad- Proslat Hooks &amp; Accessories are designed &amp; engineered exclusively for Proslat wall panels. MDF slatwall is 3&quot; on center channel. Proslat Wall Storage Solutions &amp; PVC slatwall is 4 3/4&quot; on center channel. Do these work with the new husky track walls?